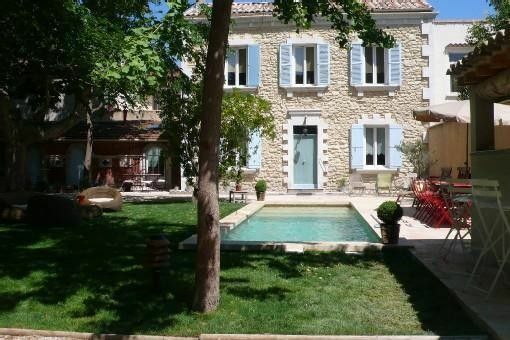 Charming stone house, fully restored, 100 SqM, sleeping 6 people in 3 air conditioned bedrooms, on a 1000 SqM wall-fenced20garden planted with limetrees, ginkgo biloba etc..; walk distance only a few minutes from the remparts and the historic downtown, an exceptional location to visit the town and make Avignon the center for your excursions throughout the Provence. Car park in the garden. Inground swimming pool 8 m x 2,50 m (which can be heated in spring and late summer), sundeck with garden furniture, summer kitchen, with barbecue. Wide kitchen opening up into the dining room and with direct access to a terrace shaded by a plane-tree. In summer, the whole garden is a green cool haven, offering also a sunny part around the swimming pool. From May to September, direct flights from the UK (Southampton and Birmingham) to the AVIGNON airport ! And since May 1st, 2015, the EUROSTAR operates a new service from LONDON down to Marseilles, with stops in Lyon and AVIGNON !! Having been living overseas for now several years, I did not want this beautiful family house to stay closed and neglected throughout the year, so I decided to propose it as a vacation rental, enabling numerous guests to enjoy its charm and spend fine holidays. Close to the historical center, which you can reach on foot (10 /15' walk). Large garden with beautiful old trees, swimming pool and sundeck with summer kitchen/barbecue and in the colder season, a very comfortable house, very well fitted with modern equipment. Big home ( we were only 2) home owner’ representative very nice and helpful. Although we did not cook kitchen inside and outside are fully equipped. The pool is a nice size. The house is in an excellent position for easy access to the bus or rail station, and across the main road from thereinto Avignon within the ramparts. There are also shops nearby. While we were there, the road access was in turmoil with great roadworks to create an urban tramway. This meant our taxi from the TGV station had to find a roundabout route and could only drop us 20 metres away from the house. The house itself is well equipped and with a wonderful garden that cuts out nearly all of the urban noise. The only snag is the bathroom which connects both with a bedroom and the landing. Fortunately there are two separate toilets. We dined outside in the garden even evening, and on hot afternoons made use of the pool. Very helpful local lady if required. Thanks for your appreciative comment. We are aware that it would be much welcome to have a second bathroom and intend to build it as soon as possible, using the sheds close to the kitchen, that are still to be renovated. Beautiful, tranquil home and garden. Elisabeth unbelievably helpful and accommodating. Elisabeth is so helpful and communicative (using WhatsApp). You quite honestly feel like a family member. She speaks perfect English, for which we were so grateful, given our shamefully poor French. The spacious garden is everything we wanted. The beautiful old trees provide welcome patches of shade in different parts of the garden at different times of the day. The pool-side BBQ provided everything a keen out door cook would want. We enjoyed 4x BBQ in our 4 day stay. Highlights were the Gurnard and Toulouse sausage we cooked, purchased at Halles market. The market is a must to visit - with a lot of empty carry bags as the wonderful produce and fun, friendly service might result in a buying frenzy as happened to us. Great to dip into the heated pool to ease the effects of touring the city on foot each day; and the dry off listening to the quiet and nothing more than the doves cooing and other birds singing. So relaxing. The walking into town is flat and only about 10 mins. We did not do this using the shortest route (via Ave St Raf) as this is undergoing major work to complete the laying of the new tram service to be completed later this year -2018. The tram service will make access to the city walls super easy when up and running. Avignon is charming. Dont miss the street with the water mills, We did the little train ride to quickly get an overview of the city. Well worth it. We will be back as 4 days was not enough to cover the city and surrounds. We caught the train to Arles for the day (17 mins ride). Really, worth a visit. Read and follow the house burglar alarm activation and deactivation carefully, or you might find yourself explaining (in your best French), who you are and why you are there to the security company if you set it off ... as we did. Thank you Elisabeth (and Driffa). You made our stay so comfortable. Highly recommended. Very grateful for this extensive friendly comment. Our family of four stayed for a week just after Easter Holidays and although the weather was mostly wet and cool (hence 4 stars), we found that this historic, charming house had enough to offer us a very comfortable stay. The kitchen is very considered with all that is needed for cookware and storage and light which is off the dining room which was very relaxing to sit and have long meals and family time. As both of our teenage boys were studying for exams, my husband and I enjoyed looking through and reading from the great library of books both in French and English - much appreciated. The walled garden is extraordinary for being so large and picturesque for sole use of residents - just a brief walk away from the city. The Owner, Elisabeth smoothed things along with her supportive texts to check on us to ensure we had everything we needed. Summed up - a lovely property with an amazing garden, which provides a great peaceful, respite from the busy, modern world. Mon son, Vincent, owner of the house, is, as myself, very greatful for your extensive and positive comment. We really enjoyed our stay at Villa Camellias! There was enough space for all 6 of us (all adults) in the house to feel comfortable. The house has a walled in garden, ideal for relaxing, and it is really close to the old city walls. It was easy to get out of Avignon if we wanted to drive further away and enjoy more of the Provence. Elisabeth was very helpful and searched answers to all our questions. Thank you very much! We had a wonderful late summer week in October! My son (the owner) and myself are grateful for your kind comment, which is an encouragement for us to keep on improving the property as much as we can. Had a fantastic week in Avignon. Elisabeth our host was amazing. A lovely lady. Communication was excellent and she went to great lengths to ensure we had a perfect week. The house was in a brilliant location just a ten minute walk into the centre of Avignon but very private and quiet. It also had some shops only a few hundred metres away so food shopping was easy. The house had everything we needed for the two of us. Only one bathroom so great for a couple or family. The only negative was lots of mosquito bites so bring your spray and use it when you sit in the garden. Driffa the lady who looks after the house locally was a joy to deal with. She made sure the house was cleaned and ready for us early on our arrival and was only 10 minutes away if we needed help with anything. In a quiet narrow street ( Rue des Camélias) starting from an avenue (Avenue de Saint-Ruf) fitted with shops. D'octobre à fin avril, électricité en plus (relevé compteur), limitée à 50 euros. Mai à octobre, l'électricité est incluse, dates précisées chaque année en fonction de la mise en service et arrêt piscine (fonction météo).